Autumn’s golden leaves combined with the winding roads around New England makes for a classic American road trip experience. This tour is designed to give you the best possible chance of seeing the leaves at their most glorious point due to its destinations, directions and the altitude variations along the route. Happy leaf peeping! Remember, any and all of our pre packaged road trips can be altered to meet your exact needs and wants. Do you have more or less than 14 days for your road trip? No problem, we can bolt on extra nights to allow more time to explore or shorten the number of destinations as required. Just let us know when requesting your quote. The colours of the trees will amaze you! If catching the leaves at they’re best is your priority then you should aim to take this trip during October. Catching the leaves turning every shade of gold and red can be a tricky business. This route is designed to pass through the best areas and on a north/south direction giving you the best chance of catching the leaves at their best. After flying into Boston, you’ll collect your car rental and take a short drive south to historic Plymouth. When the pilgrims got lost when searching for New York, they happened across this patch of land and named it after the port they had departed on the over side of the pond. Today you walk in the footsteps of the Native Americans and the Pilgrims, or visit a stunning replica of the Mayflower boat that carried them. Afterwards, take the scenic Highway 6 out to Cape Cod. Summer home for the Kennedy's, this 65 mile long peninsula offers historic towns, fantastic sea food and wild sand dunes. Super busy in the summer months, spring and autumn also offer enjoyable weather and migrating birds. From your Hotel or B&B, you’ll be able to relax among the natural surroundings and charming Cape Cod villages. Leaving Cape Cod you’ll soon arrive in pleasant Providence, capital of Rhode Island. On the way here you’ll be able to take a day ferry to Martha’s Vineyard, or perhaps visit here or nearby Nantucket whilst staying on Cape Cod, further details will be in your Road Trip Pack. From your Providence base you’ll be able to swing by Newport and check out the incredible summer homes such as The Breakers, the Vanderbilt mansion. Another day trip option is Essex, Connecticut - Small town old America is preserved in time here, with white picket fences surrounding perfect examples of federal and colonial architecture. Essex also boasts one of the oldest Inn’s in America, trading continuously since 1776. The towns origins go back to 1635, and most of the buildings here were built with money made trading Rum and Tobacco in the 19th century. Heading north gives you the best chance of catching the Fall leaves at there best, as the leaf changing creeps north to south over the Autumn months. The Berkshires are positioned in the western hills of Massachusetts, and comprise tree covered hills and picture perfect towns such as Stockbridge. Your Itinerary Pack will help you find the most scenic roads, explaining why so many Bostonians drive out here for a break from the city. Cruising due north along Vermont’s scenic roads covered in golden leaves, including Vermont’s very best road which lies to the west of Green Mountain National Forest you’ll eventually come to a pretty town called Stowe. This ski resort town is as cute as a button, provided state of the art lifts with small town charm. In the summer months, biking and hiking take over. And come Autumn, the leaves put on a show for all to see. Like Ice Cream? Then visit the Ben & Jerry’s factory that sits on the edge of town for a tour and some sampling. Heading east, you’ll leave the “Green” mountain forest area and head into the “White” mountain forest areas of New Hampshire. The changes in elevation here will also help you find golden leaves along your road trip. Mount Washington State Park is the highest state park in the East and Mount Washington dominates, why not take the Mt. Washington Auto Road for a view from the 6288 ft summit. Today you’ll leave New Hampshire and enter Maine on route to Acadia National Park. People have been drawn to the rugged coast of Maine throughout history. Awed by its beauty and diversity, early 20th-century visionaries donated the land that became Acadia National Park. The park is home to many plants and animals, and the tallest mountain on the U.S. Atlantic coast. Today visitors come to Acadia to hike granite peaks, bike historic carriage roads, or relax and enjoy the scenery. A full day to explore every corner of Acadia National Park, in the autumn months the park becomes just as colourful as the roads throughout New England that have taken you here. Cadillac Mountain, the highest point on the North Atlantic seaboard is the place to go for impressive sunrise or sunset views. 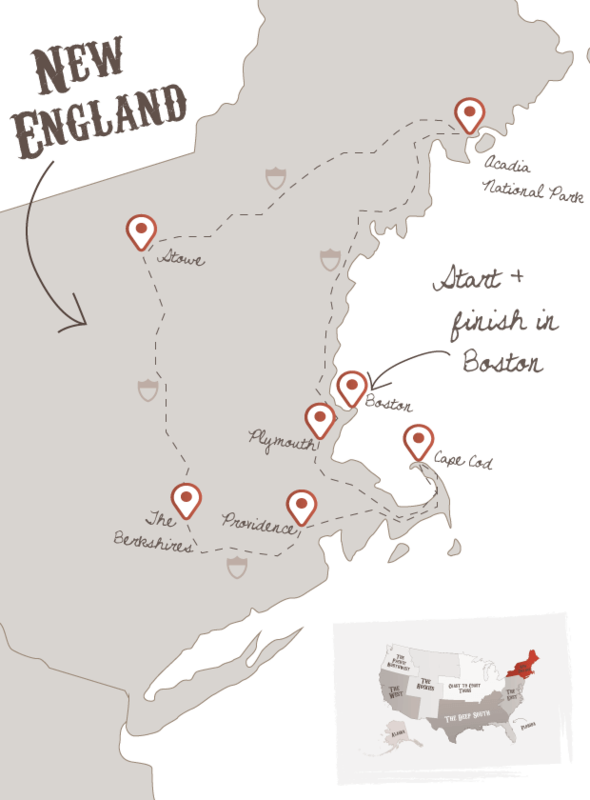 Enjoy your breakfast in Acadia National Park before heading south along the classic Maine coast to Kennenbunkport. Here you'll be able to enjoy one of their famous crab meals. 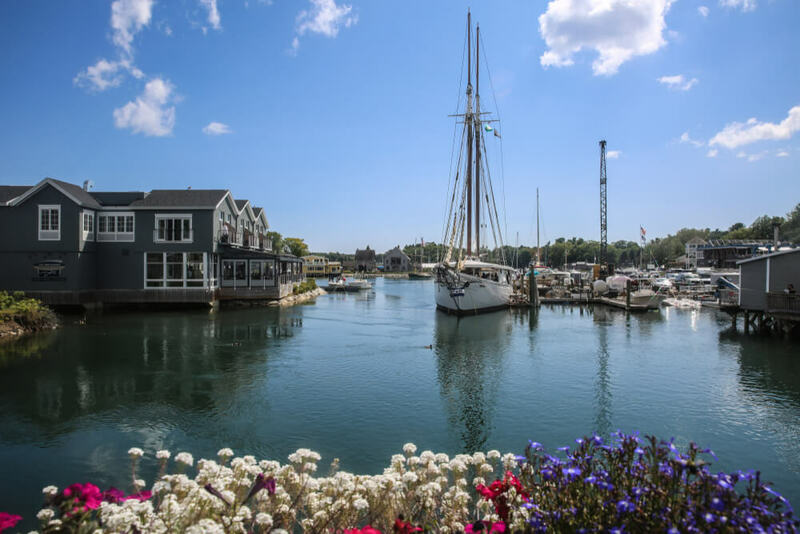 Bask in the sun of the wonderful beaches in this classic New England fishing town after a fun day exploring the New England towns dotting the Atlantic coast such as Camden, Boothbay and the state capital Portland. Time to head south to Boston. The most historic part of the city is the North End. Famous for its cobbled streets, characterful churches and revolutionary past. If you're visiting in the autumn, be sure to try to fit in a whale watching trip. Boats depart regularly next to the aquarium. Tonight, enjoy traditional New England hospitality in the North End with seafood or Italian. Both are superb! A full day for to explore some of Boston’s must see places and charming cobbled streets. If you were a fan of the sit-com Cheers, then make sure you swing by the bar to say hello to the guys. Other highlights include walking the “Freedom Trail” and visiting the world famous Harvard University. Tomorrow you'll catch your short(ish) flight home. We'll usually try to get you a late flight home, which will allow you more time to explore and the chance to sleep during the flight home. Every road trip is unique in some way, and that’s why we create a personalised travel pack to help you get the most out of your valuable holiday time. The pack contains a day by day itinerary, driving tips, maps detailing the scenic routes, hotel information, emergency numbers and so much more. This pack will provide you with the knowledge to explore North America with confidence - Perfectly organised freedom is our aim. Driving in America is a pleasure. The roads are often wide, empty and scenic. Combine this with an automatic transmission car designed to cruise the roads of this continent, and you'll easily eat up the miles as you tour around on your flydrive road trip holiday. Some of our hotels are booked on a room only basis, however breakfast maybe included on certain occasions. Your quote and Itinerary Pack will detail when this meal is included. America offers food of the highest standards and widest possible choice, just don't underestimate the portion sizes as value for money is always apparent when dining in America or Canada. Enjoy! We are experienced road trippers ourselves, so we bring an expertise that is hard to match. This means you'll see the best places, drive the best roads and stay in the best hotels - safe in the knowledge that, should you feel the need our concierge service is just a phone call away. Organising a multi destination road trip is time consuming to say the least, so why not sit back, relax and leave it to the people that live to road trip. Furthermore, our business structure is built in order to offer you the very best value for money - whether you are a high roller or on a budget, you'll get a great deal with us. Simply click one of the "Request a quote" or "Start your trip now" buttons and follow the instructions - You'll then receive a personalised quote within a day or so. Once you are happy with road trip, simply click the "Pay Deposit" button on the emailed quote and leave all the work to us. The team at The American Road Trip Company will work hard to find you and your fellow road trippers the shortest, cheapest and most convenient flights possible. Our preferred partners are British Airways, American Airways and Virgin Atlantic. In today's golden age of travel, these airlines offer first class service and state of the art aircraft including seat-back, on demand video and ergonomically designed seats. When requesting your road trip quote, you'll select your preferred type of accommodation. Whether you choose from our 2 - 3*, 3 - 4* or 4 - 5* or a mix of styles and standards - the choice is yours. Our team have access to rooms in 800 hotels, motels, lodges and B&Bs spread across North America. We've personally stayed in or visited the majority of these locations and all the accommodation has gone through a strict suitability test. North America is packed with outstanding hotels and charming B&B's, and when you take a road trip holiday you'll get to experience quite a few along the way. Whether you choose an SUV, saloon car or a convertible to drive around the highways of North America. Rest assured that The American Road Trip Company only partners with major rental car firms such as Alamo and National. And as such, you'll only be handed the keys to the very best cars. As for car insurance, which can be confusing and expensive on the other side of the pond. We'll guide you through the complicated terms, making sure you have the right coverage for you. Don't forget to check out this road trip's Itinerary tab to see more amazing pictures from our "Autumn in New England" tour. You'll also be able to read a little bit about what you'll be getting up to on each and every day of this incredible holiday adventure.